The first orchid of S.B.O.E. 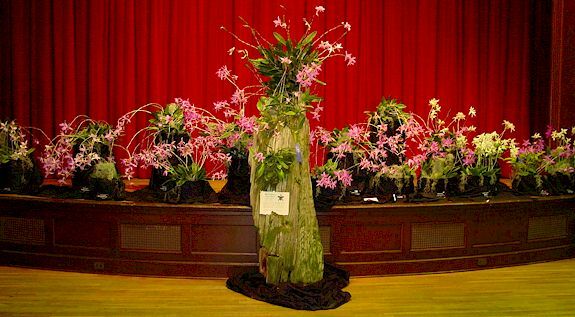 Robert Chrisman, an avid gardener throughout his entire life, met his first orchid at the Thrifty Drug Store in Beverly Hills, California. It was a small three bulb piece of the hardy mexican laelia species, Laelia anceps. 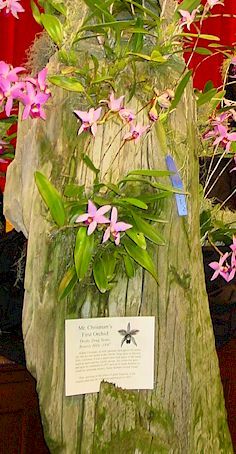 His collection grew and upon his retirement in 1957 moved to Santa Barbara to found his retirement nursery, Santa Barbara Orchid Estate. Here, growing on this piece of giant Sequoia, is the original plant that Mr. Chrisman purchased in 1947!